I’m not a particularly big believer in brand loyalty when it comes to smartphones. Having been a user of both iOS and Android, I can say that each system has its pros and cons that gives you a different experience. But after being an iPhone 6s user for the past 5 years, I was due for an upgrade and the new Samsung Galaxy S10 drew me in immediately. I bought myself the regular S10 model in Prism White and so far after using it for close to two weeks, there are many features that I have been enjoying immensely (even with the painful transition process of transferring backups to Android). Here’re 8 key features about the S10 that I believe make it a smartphone worth checking out in 2019. As per its predecessors, Samsung kept with their Infinity Display with the S10 but altering it in a way where it’s now known as the Infinite-O Display (where the front-facing camera lens is embedded directly in the screen). With a goal of having a smartphone with the best possible screen to body ratio, the hole-punch camera actually helps give off the impression of a borderless piece of glass. Because of that, the phone can appear bigger than it actually is. The design is quite slim and light, which makes it really nice to hold (as someone who doesn’t particularly enjoy bulky big phones). The S10 comes with a 6.1-inch diagonal display which actually makes it almost as big as some of the previous Plus models. I’ve been enjoying having more room to watch my movies, read books, and play games on the immersive 19:9 Infinity-O Display. 2) The precise display cutout. 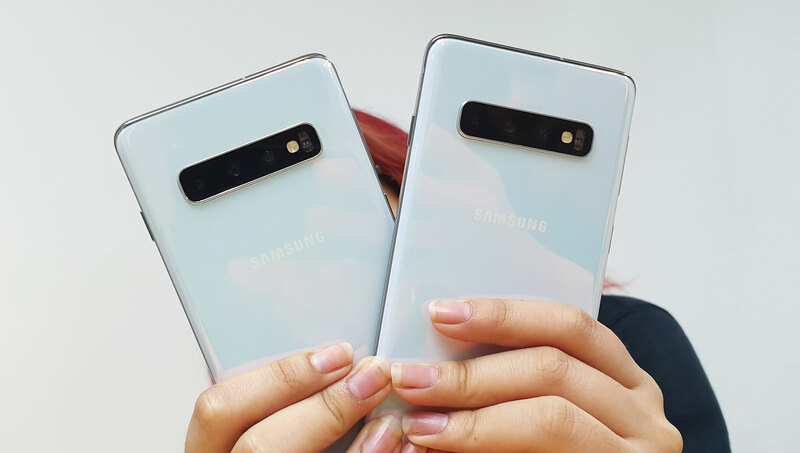 Compared to the S10 Plus that has an oval-shaped cutout, the S10 sports a simple hole-punch-size cutout for its single selfie lens, which I find far less distracting. Reading articles is quite fun to do with the bigger screen space, and when taking selfies or playing games with the phone, the hole-punch never took away from the experience. I will say that when taking photos of myself, the obvious cutout actually helped me focus directly at the lens which is a great feat for someone like me who usually can’t seem to have proper eye contact with the camera lens. FYI: If you’re bothered by the hole-punch, try using one of Samsung’s cleverly designed wallpapers to hide it. It won’t help much when you’re streaming videos or browsing the web, but the disguise looks pretty damn good when you show it off to friends. 3) The Dynamic AMOLED display. The S10’s screen comes with a Dynamic AMOLED display, which has gotten the highest grade from the screen testing experts at DisplayMate. If you’re not really much of a numbers person (like me) and you can’t tell from those type of ratings, just take a look at the stunning brilliant colours of the S10 screen that shows why the S10 display is one of the best on the current market. It supports HDR10+ content as well as HDR10+ video recording. Added with top-notch photo capture, the S10 does extremely well in making content pop on screen better than most smartphones. The S10 screen also has improved blue light filters, which do a better job of cutting down on the slice of colors that usually makes it harder for people to fall asleep. Overall, I’d say the S10’s display is pretty close to perfect. One of my main criterias when choosing a smartphone comes down to its camera, and I was pretty intrigued by the S10’s camera that comes with a set of powerful lenses that helps capture photos in exquisite detail. The S10 comes with Samsung’s all-new 123-degree Ultra Wide lens, along with 12MP, Wide-angle, Dual Aperture, Super Speed Dual Pixel lens. There’s also an additional 12MP Telephoto (zoom) lens and a 10MP, UHD, Dual Pixel front-facing camera that’s perfect for taking high-quality selfies. I really like how the S10 can switch to the type of image users want to capture based on the scene, so you can go from zooms to portraits, to ultra-wide landscapes and group shots. But a feature that I’ve been appreciating lately has been the Instagram mode that’s integrated to Samsung’s stock camera app, meaning the photos and videos are taken with the phone’s camera instead of through the Instagram app which could decrease the quality. It basically brings the filters directly to the camera software and I can upload my photos straight to my Instagram Stories without leaving Samsung’s default camera software. The feature also includes the usual Instagram stickers, editing tools, text, hashtags and more, but there’s little mode options such as the beloved Superzoom and Boomerang. Hopefully there’ll be an update soon to include those. The S10 comes with a 3,400-mAh battery, which means that the device doesn’t last as long on a charge but it can still go a long time without needing to top off the battery. So when it comes to the Wireless PowerShare function, I use it sparingly. This feature essentially lets me wirelessly-charge compatible phones and wearables just by laying it on the back of the S10. When charging other phones, it is a little slow so I mainly use this feature to charge my Galaxy Buds. It’s very efficient and saves me time in needing to find a port to charge my devices when I’m out and about. FYI: You can still use your S10 while charging the other phone, but do note that this feature will drain your phone’s battery faster. However, the charging is stopped to prevent draining the S10’s battery when its battery level is below 30%. 6) The in-display fingerprint scanner. Being the first smartphone in the world to use an ultrasonic in-display fingerprint scanner, I was quite excited to test it out and so far, I’m impressed. As the scanner utilises ultrasonic waves to map out my fingerprint’s unique pattern, it’s been a speedy process in unlocking my phone. The scanner also features an anti-spoofing algorithm that lets it recognize my real, physical fingerprint and reject images or copies of it—which makes it faster and safer than an optical fingerprint scanner. Instead of holding the thumb down, I usually like to just tap the scanner so that it can unlock faster and it’s been nice to not have to turn on the display to access this feature. Protip: To help make the reading of your fingerprint better, you can add multiple versions of your own fingerprint at the “Biometrics and security” section in your settings. The S10 comes with Exynos 9820 and 8GB of RAM, making it one of the fastest phones on the market. Graphics-intensive games like PUBG have been great to play on the S10 as the phone handles the burden well—games hardly lag while the phone doesn’t really heat up. Let’s get this out of the way since some may find it insignificant. When researching on potential options for my next phone, looking for smartphones that still had the headphone jack was actually a big deciding factor. Even if I prefer listening to my playlists with wireless audio devices, having the 3.5mm headphone jack there gives me a sense of satisfaction because there’s an option of using it if needed. I don’t need to bother with adaptors and I relish the fact that I can easily charge my phone and listen to music at the same time. For its retail price of RM3,299, I have no regrets getting the S10. The S10 offers what I generally look for when upgrading smartphones; superfast performance, a beautiful display, wireless PowerShare, great camera quality and battery life, and with a less distracting camera cutout than on the larger, pricier S10 Plus. If you’re looking for an all-rounder phone that’s packed with the latest technology, I’d say it’s worth a look. For more information on the Samsung Galaxy S10, you can check out their official website here. This article is written is collaboration with Samsung.